We're taking a look at what kind of buildings and decorations you can place around your town in Elder Scrolls: Blades! Our Elder Scrolls: Blades Town Upgrades & Decorations Guide features all the information you'll need to level up your town and have it looking good! Town level is actually pretty important, because the higher it is the more you will be able to build and craft. Prestige is what you need to earn to level up your town. Each time you place a new building or decoration, you get more prestige. You also get prestige from placing buildings on Ruins which removes these broken parts of your town. Town Level determines what buildings you can place, but also how high you can upgrade those buildings. If you want to start being able to craft better items, then you'll want to focus on building up your town! One of the issues with town building currently is that resources are very hard to find. Check out our guide on how-to grind those up to make your life easier! The town is made up of build plots and decoration areas. You can place various building on the plots, but some of the larger ones will take up two plots. So, be sure to take that into account when building. Decorations can be placed on the small circle areas, these include trees, banners, statues, and more. 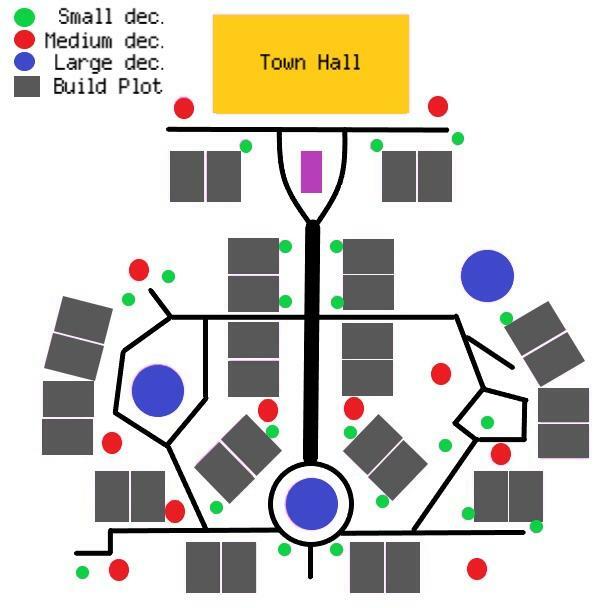 Here's a map where you can see all of the available plots for buildings and decorations (credit to Reddit). Here's a full list of building you can place in your town. Each building has a Timber, Stone, and Castle version. These do not improve the quality of the items they create, but only changes up the style and adds a bit more prestige to the building. Some buildings require you to have a higher Town Level before you can build them. I don't have all the information on required resources for each of the buildings yet, but I will update this when I do. The Alchemy Laboratory is where you can craft potions and poisons. If you are looking for those illusive health potions, then this is where you can get them. The Alchemist sells potions and poisons, and brews them for customers who supply their own ingredients. If you want to enchant your items, then this is the building to craft. An Enchanter can imbue weapons, armor and jewelry with permanent magical effects. Here's where you can buy and sell armor and weapons, temper, and salvage them for resources. Visit the Smithy to buy, sell, salvage and improve weapons and armor. If you are looking for decorations for your town, then the Workshop is your main option. It will also sell you materials that are randomly refreshed everyday! The Workshop handles the construction of statues, banners and other town flourishes, and also sells construction materials like lumber, limestone and copper. Rebuilding Houses will increase the population of Olympus, while upgrading them will restore the town's prestige. Most decorations can be created at the Workshop, but there's some that require you unlocking them by completing quests. Decorative Planters: 10 Seeds, 5 Copper, 1,500 Gold. Fire Pit: 100 Lumber, 10 Bronze, 2,500 Gold. Mulberry Tree: 5 Seeds, 1,000 Gold. Potted Plants: 10 Copper, 5 Seeds, 1,500 Gold. Short Shrub: 5 Seeds, 500 Gold. Small Torch: 1 Fabric, 50 Lumber, 500 Gold. Small Cedar Tree: 5 Seeds, 1,000 Gold. Tall Mulberry Tree: 5 Seeds, 2,000 Gold. Tall Shrub: 5 Seeds, 1,000 Gold. Training Dummy: 4 Fabric, 80 Timber, 1,500 Gold. Vegetable Patch: 5 Seeds, 500 Gold. Archery Range: 10 Fabric, 100 Lumber, 10 Dye, 4,000 Gold. Aspen Tree: 15 Seeds, 4,000 Gold. Outhouse: 1 Fabric, 400 Lumber, 6,000 Gold. You should always consider firstly upgrading smithy to level 5 and then the rest of the town. When you do – chests will give you much better equipment (weapons, armor, tempering materials etc.) and this will make you level up faster. I believe I read that you don’t want to upgrade your smithy past your level because then you can’t purchase the right resources for gear? That’s ablosutly true. However I’ve discovered that when I upgraded smithy to Orchish level, it started to give me orchish items in chests. When I upgraded to Dwarven, they’ve also started to appear randomly in chests. It may also depends on player level but I’m pretty sure, that smithy level is also considered. Seems that way, did upgrading your smithy give you a lot of prestige towards Town Level? Chest loot is based on lvl not your smithy, im lvl 20 and getting mostly silver gear, while my smithy is lv9. I upped my smithy a few lvls so when i ding 28, i have all materials to fully temper a glass set. So i would say keep your smithy a few lvls a top off you.